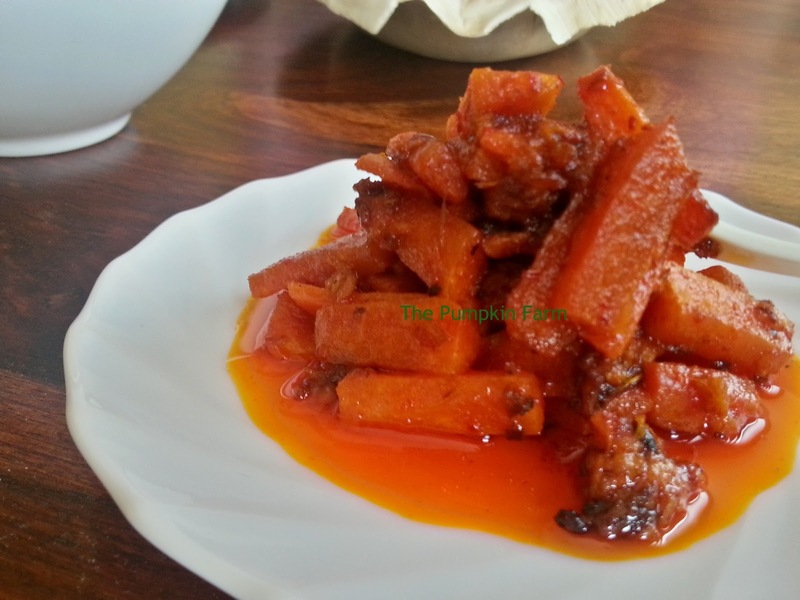 This recipe, was not learnt in Goa but much later, when I ate vinegar based pickles, I started exploring for more recipes. This has excellent sweet and sour flavor that comes from vinegar. Infact with some more spices in it, the same base sauce can be used to make meat based pickles as well. Especially chicken, I think boil it and then follow the recipe. My cousin, often eats the chicken pickle Goan style for his lunch stuffed in bread or bhakri. He says that he can live on this pickle for life, I cannot talk about that chicken pickle but am similarly fond of this carrot pickle. Make a wrap with any vegetable that you dont like and top it with pickle , you will love the tangy flavor this one brings out. I served this rice bhakri. Made a roll using the bhakri, stuffed with spicy zhunka, fresh spring onions roughly chopped and loads of carrot pickle..it was the best wrap I have had till now..
5) Add the Vingear mixture and let it simmer till the carrots become slightly cooked but yet have the crunch. 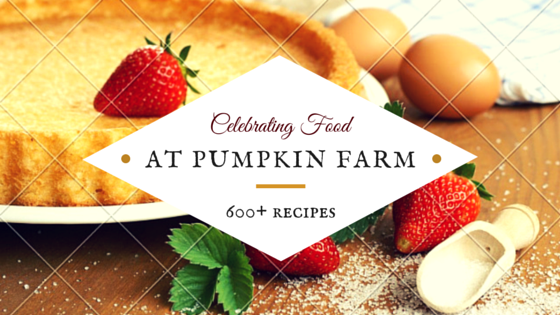 6) Remove from heat and let it cool down. Keep in a jar in refrigerator for 1 week. Canola Oil - I am using a lot of canola oil in my cooking offlate and am completely sold out. Though I have always used the oil in the past when not in India, this is the first time I used the oil here, courtesy my gift pack recieved from Hudson. Hudson have recently launched their canola oil in India. I would urge you to try it once to know the goodness. Am not paid for this review, the opinion is based on personal experience. I've eaten something similar with beets in it. Looks divine. Canola oil are the best, even am started using them..Btw tongue tickling pickle, lovely and super attractive colour. This is new to me but pickle any style is welcome in my home! I have been using Canola oil for many years. whenever I deep fry food I use it. It is the healthier option when using non flavored oils - instead of vegetable oil or canola oil and it has a high smoke point so does not burn making it good for frying. tongue tickling pickle... i learnt that making pickle is goan style!! I didn't think making pickle will be this easy thanks for sharing. The pickle looks good! I would never have thought about adding this to a wrap - sounds delicious. BTW, I don't want to sound insensitive but couldn't stop myself from asking. How is your sister doing now? When we say pickle curd rice comes to my mind immediately. :) Bet this tangy spicy mix to be good with anything. Pickle looks real yum!! !Easy to make too!!! I have been using canola oil for the past two years it is really good!! It sounds divine. I have never tried making pickles using vinegar. My husband is a great fan of these vinegar based pickles! 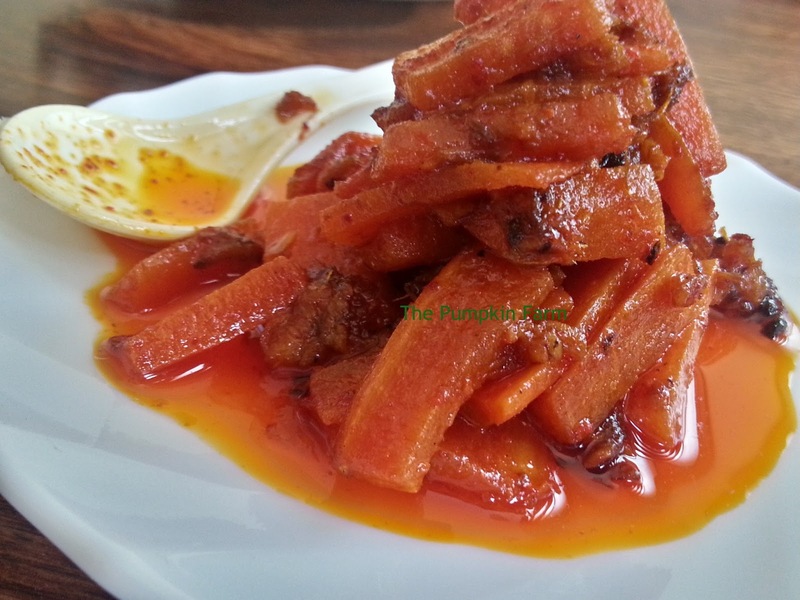 Carrot pickle looks tangy, spicy & delicious.. Very easy to make too.. Love it. Mouthwatering pickle. Looks very tempting.